This is Vogue 1314 by the fabulous designer, Tracy Reese. This is my fifth pattern from her. I own every single one she's done for Vogue Patterns and hopefully I'll get around to making them. 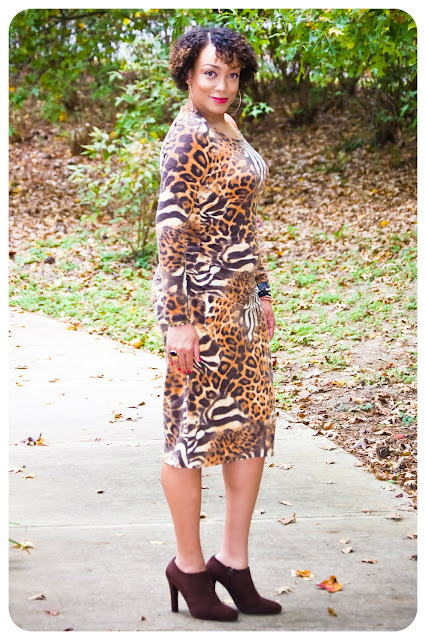 I made this dress out of this gorgeous mixed animal print wool-blend jersey from Mood Fabrics.com. This fabric is gorgeous and truly luxurious. It was so easy to work with. Just keep in mind if you choose to purchase it that it's only 54" wide. This pattern was really easy for a Vogue "Designer" pattern. The most technical skill you need is the ability to create gathers for the ruched detail. 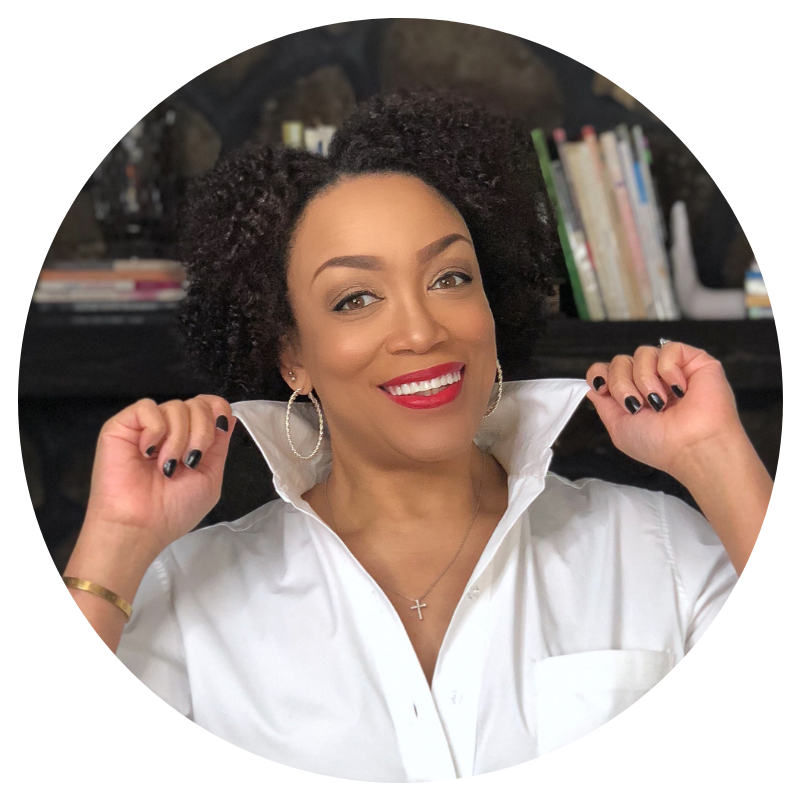 I initially cut out the size 16 -- BEFORE reading all of the prior reviews. Just like everyone else said, this pattern runs pretty big. I had to cut it back down to probably a 14 (or a tad smaller). It's supposed to be a "fitted" dress. And I did my usual lengthening alteration of adding three inches. And I omitted the lining. I guess it was suggested because maybe the original designer dress was created out of a very lightweight jersey. But my jersey is substantial enough to stand on its on. And I added my chocolate brown suede Ralph Lauren ankle boots and my orange suede fringed Big Buddha bag. Stunning and it's a great fit and the length right below the knee, good choice. Very Nice. Love the print with all my fall colors. Very nice dress and the print is stunning. LOVING it! You look FAB as always. This is beautiful. You make me want to get out of my fear of animal prints. Thanks Nik! The lipstick is Revlon #525 "Wine with Everything". Gee, this is lovely on you! The colours are gorgeous, the fabric is wonderful and your accessories are perfect. I have a similar dress, but with ruching on only one side (I think it's on old Vogue wardrobe pattern) in a purple animal print but yours is so much nicer. You look great. This is a gorgeous dress! It even brings out the highlights? in your hair. Great overall look as usual. Since your jersey is a wool jersey did you have to pretreat it at the dry cleaners? I really want to try some of these fabrics with wool but I inquired at my local cleaners about pretreatment and they were saying it would cost about 40 bucks. LOL, I don't think so for a yard or two of fabric. Levone, I pre-shrunk mine in the dryer with wet towels. Thanks! Love the mood fabric choice. Not to mention choice of pattern. Sharp!! That dress is hot! love the ankle boots such a pretty color. Great looking dress and fabric is purrfect for this pattern. Gorgeous and on trend as always! Lovely dress and the print reminded me of a pseudo mix animal print I have in my stash. Have retrieved it and plan to make a top. Thanks for the inspiration. Thanks Sheila! Good luck with your top. Hot to trot! Great lipstick too - it's a lovely colour on you. Love how you've paired the boots with your new dress. It's such a cool look. 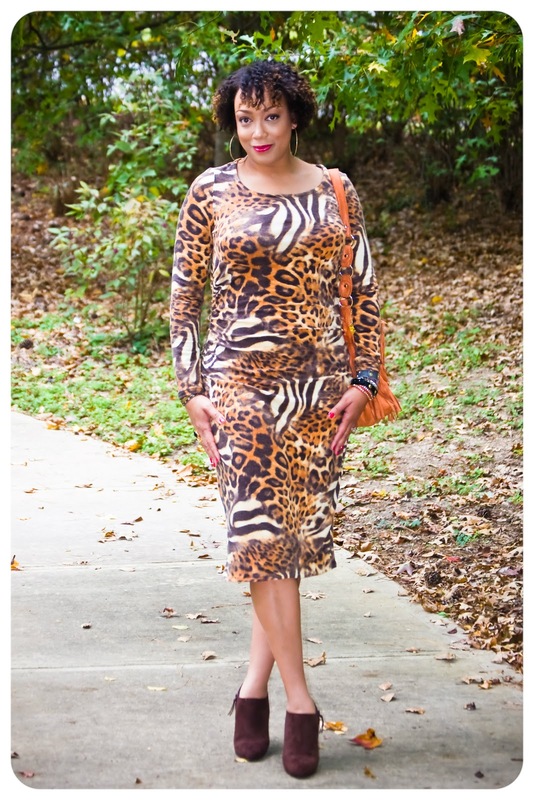 Too foxy for words but as a size 16 curvy myself, I had to tell you how great it is to see you strut yours! Perfect look. Nice job Ms Erica B...I have this same print....but I am sewing Vogue 8825...the dress version. I will post pictures when done. What I'm Wearing | Quintessential Black & White! What I'm Wearing | Red + White! Review: New Look 6123 | Draped Aubergine Dress!